According to the Centers for Disease Control and Prevention, “more than 400 Americans die each year from unintentional carbon monoxide poisoning with over 20,000 requiring medical attention”. For those who survive these deadly encounters, the probability for permanent neurological damage significantly increases. Although carbon monoxide is an odorless, colorless gas that often goes undetected, there is an easy, low cost step that home owners can take to keep themselves safe; installing a CO detector and alarm. Any appliance in the home that burns fuel (stove, fire place, hot water heater, boilers) creates carbon monoxide during the burning process. If the heating unit were damaged or if the venting were modified by someone other than a qualified contractor, the home could be exposed to CO gases. Therefore we strongly urge any and all home owners to place a CO detector and alarm in the room where their heating system has been installed. We cannot stress enough the value and importance of having these devices installed throughout the home and in areas with high CO activity. 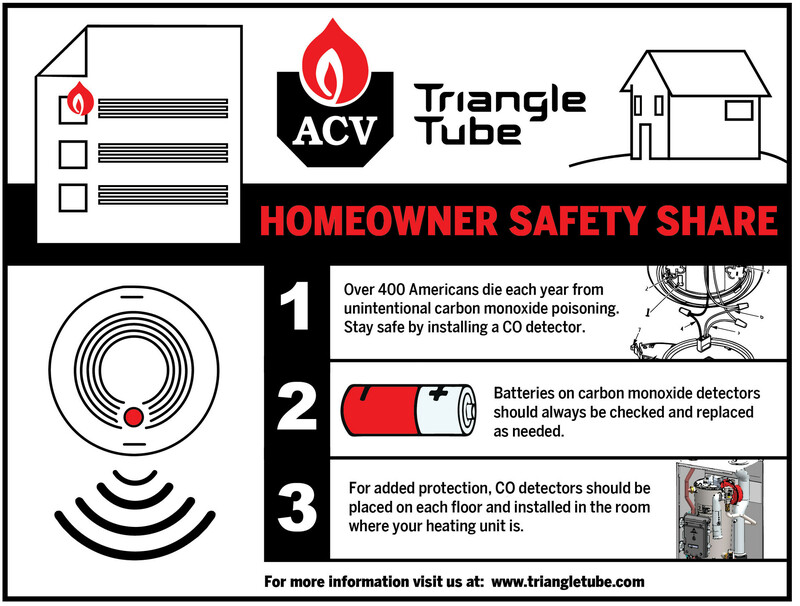 Detectors and alarms are readily available at your local hardware store and should be installed on each floor. Batteries on carbon monoxide detectors and alarms should always be checked and replaced as needed. We also strongly advise that homeowners leave the repairing of any fuel burning appliances to qualified heating professionals. Tampering with sophisticated hydronic equipment without the necessary training, skill-sets, and experience can compromise the integrity of the unit and increase the risk for a leak. *Please note that these preventive maintenance procedures and safety precautions are included in ACV TTP Prestige instruction manuals and warranty cards.